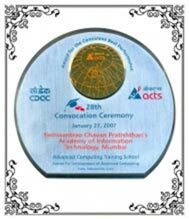 C-DAC is a Scientific Society of the Ministry of Communications and Information Technology, Government of India. C-DAC’s Advanced Computing Training School (ACTS) is dedicated to create high quality manpower for IT industry through the designing and delivery of various IT Courses. These Courses are offered through a network of Authorized Training Centres (ATCs) in India. Academy of Information Technology (YCP) is one of the most Prestigious Centres of C-DAC ACTS. AIT Mumbai under the wings of Centre for Development of Advanced Computing (C-DAC) Pune, established in 1999, is just a small step towards a bigger aim of providing Quality Computer Education and transforming its students into tomorrow’s professionals. It was the first Centre to be ISO 9001:2000 certified. AIT has modern infrastructure including corporate standard laboratories. These are well-equipped laboratories with latest technologies and state of art infrastructure. This Centre is proud to remain associated with the best faculty in the industry for technologies and soft skills. AIT has been conferred with the ‘Consistent Best Performance Award’ by C-DAC ACTS. The Centre is popular for the Advanced Courses, namely PG Diploma in Advanced Computing (PG-DAC) and Diploma in Advanced Computer Arts (DACA).